Adware Removal Tool is a good tool for removing spyware & adware and that invade our computers. Adware Removal Tool is a good tool for removing spyware that invade our computers. 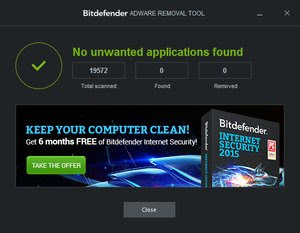 Bitdefender Adware Removal Tool is a best free tool that will allow you to analyze your system in search of unwanted adware and spyware then remove them. These adware come in many different ways, typically a toolbar that installs automatically when installing other software. This software is very simple to take in hand, you just have to launch the analysis with a click of the mouse. When you have finished, the results are displayed in a list. You will be able to see their location on the disk and the type of threat. Unwanted items can also be deleted at the click of a mouse. 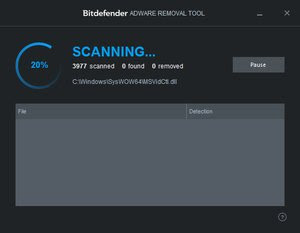 Bitdefender Adware Removal Tool offers a simpler interface, even too much! Unlike other solutions such as Malwarebytes AdwCleaner , the nature of the elements analyzed remains somewhat blurred. However, it is very convenient on PCs infested with ads. Note that this tool can work without installation on the disk.